In this webcast you will gain a good understanding about the importance of Human Resource Policies and Procedures, your business/organisation’s legal obligations and the use of best practice to implement policies and procedures for effective management of employees and HR systems and to ensure your business/organisation complies with employment law. •Policies and procedures- Why introduce them? The talent services of volunteers are vital to charities and NGO’s and important to accomplishing the mission of the organisation. Although, volunteers are not employees it is important it is important to establish standards and guidelines so that the organisation and the volunteers understand the parameters of the volunteer relationship upfront. This webinar will look at what you need to include in your volunteer policy and how to draft your volunteer agreement to suit the needs of your organisation. As well as the dos and don’ts of managing volunteers and the legal perspective. In this webcast we will address the issue of managing poor performing employees, the actions to take to take to improve performance and the steps to take to discipline and dismiss if improvement strategies fail. In this webcast we look at the difference between legitimate reasonable people management decisions/actions and harassment, bullying and victimisation laws to provide managers with information that will help them to better understand harassment laws and dispel the fear to discipline. The HR Messenger champions the importance of effective Human Resource Management for charities and small and medium sized businesses, by sharing best practice and providing practical guidelines to managers and HR professionals responsible for the Human Resource function within their enterprise. The webcasts take place on a bimonthly basis with a different people management topic each time. The topics vary ranging from employment law, performance management, absence management to employee relations and disputes. We welcome our channel followers to suggest topics by emailing us their suggestions. Our webcasts like our paid webinars are informative and interactive. We provide a step by step guide on how to design, implement, monitor, manage and evaluate a range of HR policies and procedures. When you attend one of our webcasts you walk away with practical guidelines that you can actually apply at your place of work. The channel is run by OML (Occupational management limited). We specialise in Human Resource consultancy services specifically for the not-for-profits and social enterprises. The webcasts are lead by Anita Wiafe the MD, who is a member of the Chartered Institute of Personnel and Development and the British Psychological Society. She is also a practicing organisational psychologist and an accredited Level A and B assessor for psycho-metric testing. 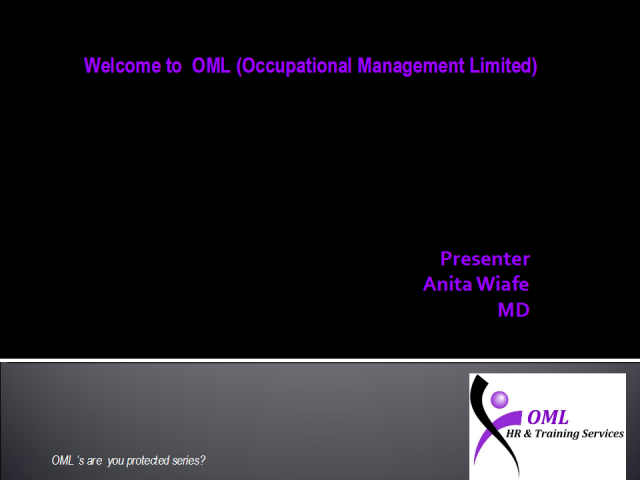 Anita established OML primarily for non-for- profit and SMEs to access HR and Training professionals at an affordable cost. She has over 10 years generalist HR experience working in senior roles providing advice, support and project work to non-for- profit, SME’s and public sector organisations. •	Managers and senior managers i.e., CEO’s, COO, directors, HR professionals etc.